(Funk House Blues) 15 tracks. The brand new album by the Swiss bluesman Philipp Fankhauser sounds surprisingly soulful and a little retro but still very modern, authentic and from a single source. 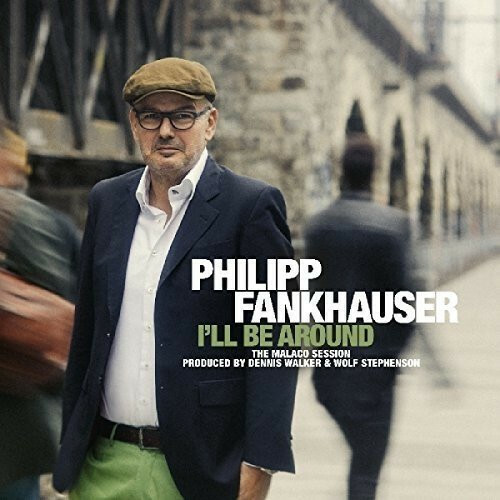 I'll Be Around' is already the 15th album of blues singer Philipp Fankhauser and it has it all! It presents a mature, safe and very relaxed Philipp Fankhauser. The music is new, but not only. It's a blues album, but also a soul album. It's kind of retro, but still very modern and topical. And it's authentic and all of a piece. It shows good, old handicraft and Philipp's endlessly talented band, who recorded the music live in the studio. Philipp Fankhauser (born February 20, 1964 in Thun) is a Swiss blues musician and songwriter. 1974 Fankhauser moved with his mother to Ticino. There he began playing the guitar at the age of 11 and developed a love of black music, especially blues. In 1977 he founded his first school band in Locarno. 1982 Fankhauser returned to Thun. In the 1980s Fankhauser visited various jazz and blues music festivals, in particular the Montreux Jazz Festival, and thus came into contact with various music greats. In 1984 he started with solo performances and worked as a Swiss correspondent for a Berlin blues magazine. In 1987 he founded the Checkerboard Blues Band, with which he performed all over Switzerland. The acquaintance with the American blues singer Margie Evans led to a joint album, Blues for the lady, in 1989. Margie Evans helped Fankhauser and his Checkerboard Blues Band to make bigger appearances. Subsequently Fankhauser gave concerts with his band at the Amsterdam Blues Festival, the Sanremo Blues Festival, the Quasimodo Club in Berlin, the Zürcher Volkshaus and played another 120 club concerts. 1990 followed the second European tour with Margie Evans. Between 1991 and 1993 Fankhauser, who was also a producer at the time, and the Checkerboard Blues Band released three more albums and performed at countless concerts, including the 1992 Open Air St. Gallen. 1993 was the seventh and last year of the Checkerboard Blues Band. The three sold-out farewell concerts at the Mühle Hunziken in Rubigen at the end of December 1993 resulted in the live album Thun - San Francisco. At the invitation of Johnny Copeland, Fankhauser went on US tour with him as a guest singer for one month in 1994. In 1995 Fankhauser recorded his first solo album in Los Angeles under the direction of producer Dennis Walker and with The Memphis Horns. During this time Fankhauser also toured several times and went to the studio with the original checkerboard blues band in 1998 to make some recordings for a new album. 1999 was the first year since 1980 in which Philipp Fankhauser did not give any concerts. He concentrated mainly on the completion of the album and on songwriting. The album Welcome to the real world with the Checkerboard Blues Band was released in early 2000. Between February and April 2000 the Checkerboard Blues Band went on their last concert tour through Switzerland. Subsequently, Fankhauser formed Funkhouseblues and the Philipp Fankhauser Blues Band, two independent, independent formations that made a broader musical spectrum possible. The Viennese electric bassist Angus Thomas is a permanent member of the band. Fankhauser performed with them at various concerts and released the live album Life's so Damn' Cool with the Philipp Fankhauser Blues Band in 2003. This was created during her performance at Piazza Blues Festivalin Bellinzona. Fankhauser subsequently released three more albums and toured the USA, Europe and Switzerland. From 2009 to 2013 he lived in a registered partnership with a Brazilian dance teacher and has been a jury member and coach in the vocal casting show The Voice of Switzerland since January 2013. Customer evaluation for "I'll Be Around (2-LP)"